Whisk the egg yolks and caster sugar together until well combined. Put the cream in a pan with the vanilla pod, bring the cream to the boil then remove from the heat. Remove the pod and scrape its seeds back into the cream (discard the pod). Whisk the cream slowly into the egg yolk and sugar mixture. Bring a pan of water to simmering point and reduce the heat to low. Sit the bowl with the egg and cream mixture over the simmering water and heat, stirring constantly with a wooden spoon, until it thickens into a custard with the consistency of single cream - this will take about 15 minutes. Strain the custard through a sieve into 6 x 7.5cm ramekins or moulds. Sit these in a roasting tin. Pour warm water into the tin to come three-quarters of the way up the sides of the ramekins. Bake in the oven for 20-30 minutes until just set. To test, remove one of the custards from the tin after 20 minutes and shake gently. There should be slight movement in the centre of the custard. If it is still runny, put the custards back in the oven for 5 minutes. When ready, remove from the oven, remove the ramekins from the roasting tin and allow to cool. Don't refrigerate. Sift a thin layer of icing sugar over the cooled custards. 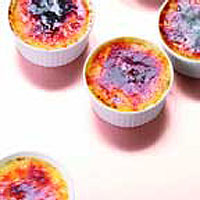 Heat with a cook's blow torch until just dissolved but not coloured. Add another thin layer of sugar and heat with the torch again. It will bubble and start to colour. Stop when it is just turning golden. Add a third layer and heat again until deep golden brown. You may feel you need one more layer but keep it thin. There's nothing worse than a thick sugar topping - 1mm is too thick. You can do the caramelisation under a very hot grill, keeping the ramekins as close to the heat as possible, but a blow torch gives you much more control. Leave the topping to set, then serve at room temperature.